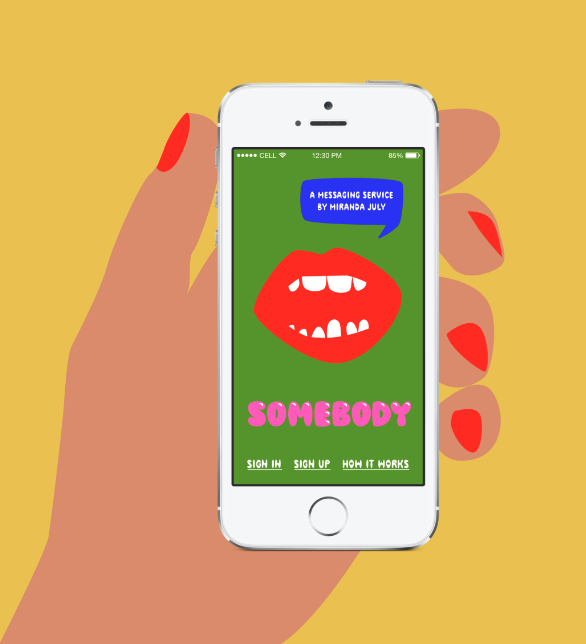 By encouraging real-life interactions between strangers, Somebody is one of the most interesting apps launched lately. 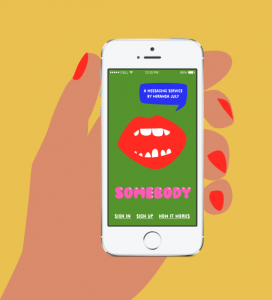 While messaging becomes an ordinary activity incorporated in most people’s lives nowadays, the artist Miranda July, in a partnership with the fashion brand MiuMiu, created an app that promotes a whole new communication experience to its users. With Somebody, when you send a message to a friend, instead of it being delivered directly, it goes to the app user located nearest your friend. And he is the one who’s delivering verbally the message. The film is part of MiuMiu’s “Women’s Tales” series. The technology involved in someone is not so new, basically it is just a GPS-based system that integrates the users with the messages sent. Miranda July herself states that “the most high-tech part of Somebody is not in the phone, it’s in the users”. 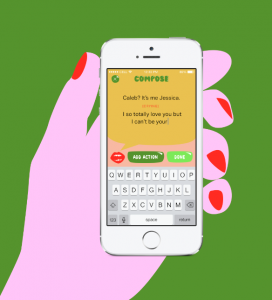 Analysing the app, it is possible to see that part of its fun is the way it plays with the traditional communication model, adding one more human element between the sender and the receiver of the messages. “Every relationship becomes a three-way”, she says. Not only the app itself acts as the medium, but also the third user that actually delivers the message. Somebody is “half app/half human”. It is very likely that you have already seen or made part of the following scene: a group of people physically together, but each on their own phone, not exchanging a word during several minutes. Probably, most of them are actually communicating with other people (or even themselves) throughout some type of tool that trades messages, likes, commentaries or just visualization of content. But the real life communication, more complex with plenty of nuances, is becoming more and more rare in people’s everyday lives. This social phenomenon is analysed by Sherry Turkle, an MIT’s professor, in her book “Alone Together. Why we expect more from technology and less from each other”, in which she argues that the more we communicate via technology and text, the less we are able to deal with real conversations with other people. Mostly because on texting the distance between the interlocutors is more preserved, making it easier to control what is being said and, supposedly, what is being understood. And specially, it decreases our contact with the other’s emotions, what can have consequences in the whole rest of our lives. This lack of intimacy and emotional feedback from normal messaging tools nowadays is what Somebody plays with while encouraging strangers to interact with each other. Although the app is a critic to the current state of technology, it is not just a let’s-all-drop-our-phones-now with some sort of proposal to getting back to another place in time where we have already been before. Somebody suggests new ways of interaction, not denying the technology, but putting it together with real life experiences. The situations that the app users are exposed does not have the intention to promote only a nostalgia feeling of “the old days when none of this technology would tear us apart”. It is much more of fun experiences that plays with the lack of control that has decreased in daily conversations, promoting situations that can lead to quite unexpected outcomes. According to what role you are playing in each specific case your experience with people around you changes. Once you are logged in the app, any of the people around you can deliver a message to you, transforming at least a little bit of the experience of being present in each moment. As a deliverer, you will be able to get into someone else’s relationship for a bit. And as a sender, there is always the thrill and curiosity of what happened to your message after you send it. In any of the cases, new experiences are involved in the use of the app, with plenty of feelings and emotions that simply wouldn’t be present in other cases. Somebody is a part social experience, part messaging, part performance art project. « Could Snapchat’s new feature challenge Facebook’s dominance in terms of trust and privacy?